Dare County boatbuilder George Washington Creef designed a new style of fishing boat in the 1870s that was a perfect match for navigating the shallow waters of the Albemarle and Pamlico Sounds and for carrying large volumes of fish. Built of Atlantic white cedar, also known as juniper, the style was called a shad boat and was made the official North Carolina historic boat in 1987. 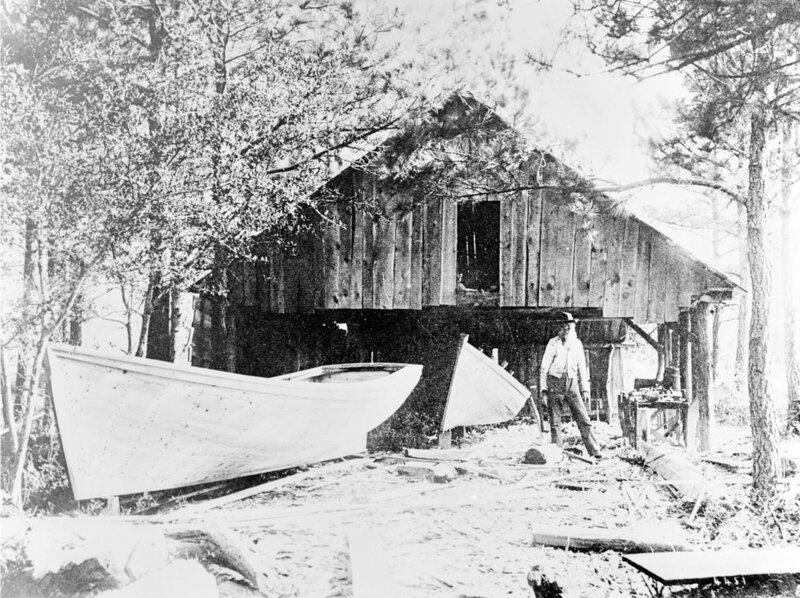 In 1888, Creef set up a boatbuilding yard at Manteo and built a 55-foot oyster boat that he named after his young daughter, Hattie. Around the turn of the century, the sails of the Hattie Creef were replaced with engines and the boat carried passengers, mail and freight between Elizabeth City, Manteo, and other soundside towns. Jesse Baum of Kitty Hawk remembered that when he was thirteen years old, “he took Orville and Wilbur Wright to their camp in a cart drawn by his family’s horse, Bold’un, after they arrived in Nags Head on the Hattie Creef,” in a collection of stories about life on the Outer Banks written by Carol McAdoo. A photograph of Orville Wright talking with reporters on the deck of a boat leaving Manteo after he had successfully tested a new style glider, staying aloft for a record-setting nine minutes and forty-five seconds, at Kill Devil Hills in 1911 was taken on either the Hattie Creef or the Trenton, according to conflicting sources. One of the Dare County towns served by the Hattie Creef was Buffalo City on Milltail Creek, a tributary of the Alligator River. Surrounded by rich stands of cypress, juniper and pine, Buffalo City was a logging town that also produced vast quantities of moonshine. “Large shipments of sugar arrived regularly on the tugboat Hattie Creef, supplying dozens of stills scattered among nearby forests and on the banks of Milltail Creek,” NC historian and author Jay Barnes wrote. 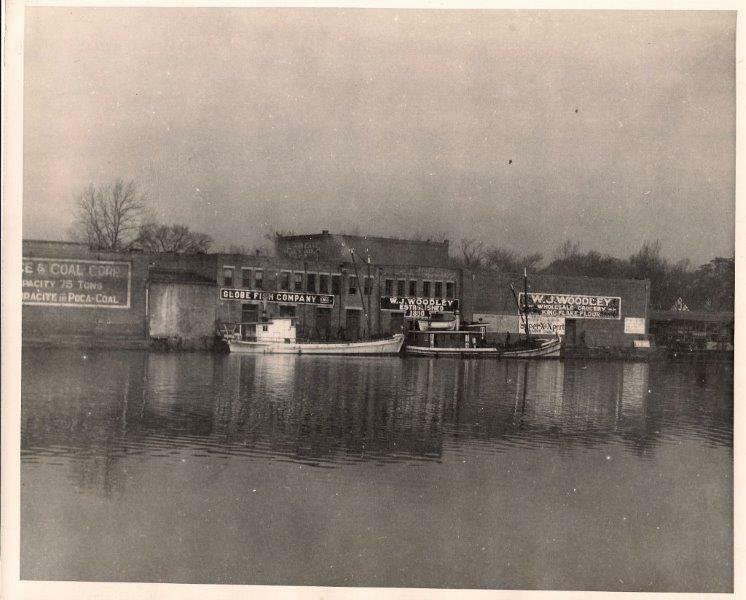 By 1915, the Globe Fish Company in Elizabeth City owned the Hattie Creef. The Elizabeth City Chamber of Commerce promoted the area’s “excellent transportation facilities by rail and water and low rates” that year, noting that 43 freight boats traveled from the town to “the lower sound country of North Carolina,” that regular passenger service to points as far south as Hatteras was available, and that trains and boats connected the town to Norfolk, Virginia. E.R. and Arthur S. Daniels from Wanchese started Globe Fish Company in 1911. 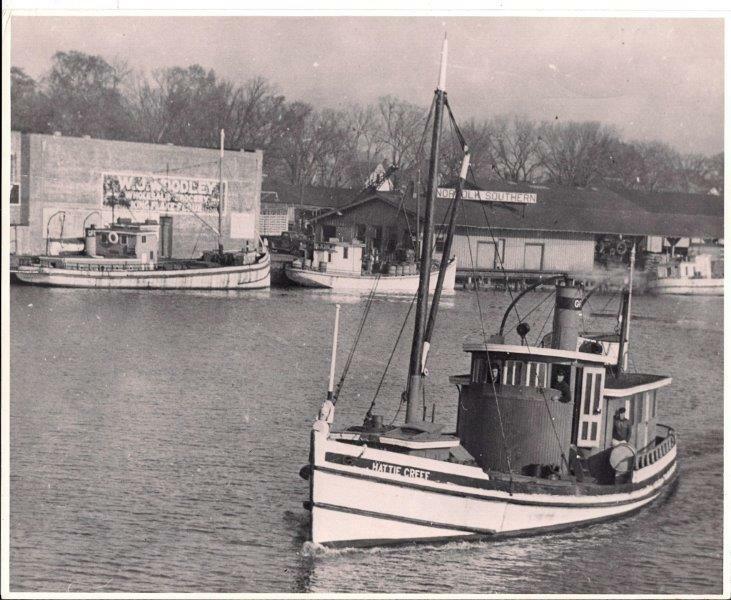 A fleet of boats called the Wanchese Line picked up fish at Wanchese, Mashoes, Roanoke Marshes, Manns Harbor, Rodanthe, and Stumpy Point and returned to Elizabeth City where the fish was shipped by rail or truck to northern markets. Boats in the Wanchese Line included the Hattie Creef, the Pompano, the Mallison, the Lloyd Jr., the Whitewing, and the Robena. The company advertised “Highest Cash Prices To The Fishermen – The Largest Wholesale Buyers OF Fish In North Carolina” in The Dare County Times in 1935. The Fishermen’s Exchange, the fish packing plant at Stumpy Point run by George M. Wise, was moving three million pounds of fish valued at $200,000 through its doors in 1935. Ice for the plant was boated in from Alvah H. Ward’s ice plant in Wanchese or trucked in from the Pamlico Ice and Light Company in Engelhard. “The daily boat of the Globe Fish Company is the one dependable thing, and that requires about eight or nine hours to get the fish to Elizabeth City,” the Dare County Times reported. 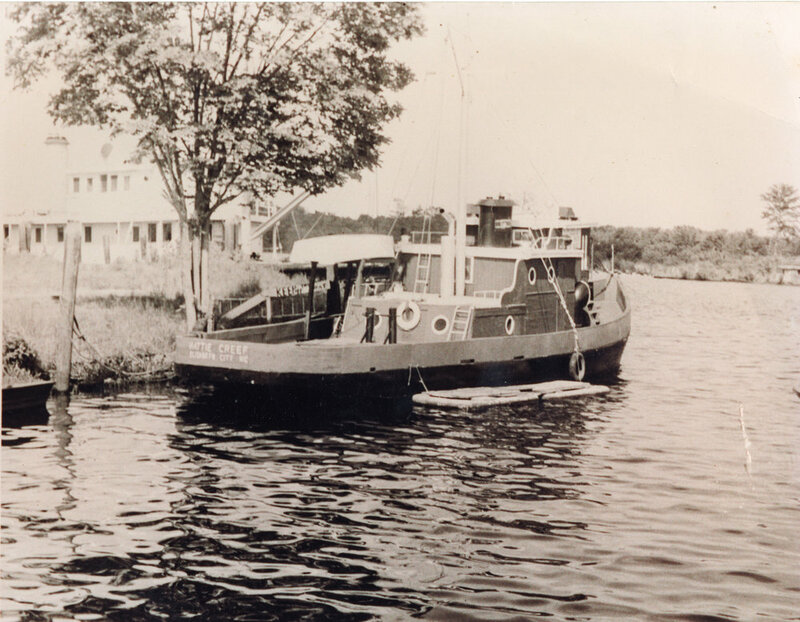 After serving as a buy boat for Globe Fish Company, the Hattie Creef hauled barges, provided leisure cruises on the Pasquotank River, and was used to catch blue crabs before Elijah Tate of Coinjock brought her back to the Outer Banks in 1968. 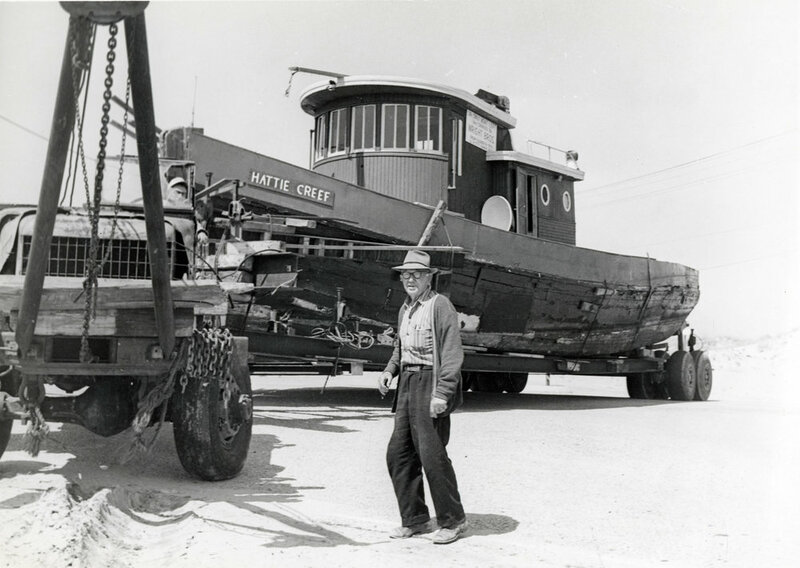 Tate planned to make the boat a museum, but eventually sold it to a woman in Salvo who turned the boat into a restaurant called the Hattie Creef Drive-Inn. The venture proved unsuccessful and the boat was abandoned. In 1978, the remains of the Hattie Creef were dismantled. In The Fishermen's Exchange, Charles Meekins of Stumpy Point talks about the fish house called the Fishermen's Exchange, the Hattie Creef, and about ice, fuel and mail delivery to the village in a 2016 interview with Barbara Garrity Blake. Barnes, Jay. “The Rise and Fall of a Moonshine Capital.” Our State, 28 Feb. 2011. Couch, Danny. “The Hattie Creef Is Gone After Many Lives On O.B.” The Coastal Times, 8 June 1978. McAdoo, Donald and Carol McAdoo. Reflections of the Outer Banks. Island Publishing House, Manteo, NC. 1976. Ward, Alvah H. Jr. and R. Wayne Gray. When Ice Came To The Outer Banks: A Local History of Ice and its Impact on the Development of the Coastal Region. R. Wayne Gray and Alvah H. Ward Jr., 2013.